Avery Elle: A Winner & Sneak Peek Time!! I am so excited that this week is finally here. 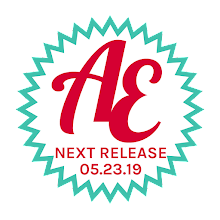 Today I get to announce our latest AEI♥U Challenge Winner and we will be releasing four new stamp sets, three new dies, two new sequin blended packs, three new card stock colors and four new ribbon colors this Thursday, May 2nd. We will be celebrating on the 2nd with a Design Team Blog Hop featuring the new products as well that you will NOT want to miss. Our AEI♥U Challenge Winner is Jen Rzasa. Congratulations! Jen's use of our digital freebie is just stunning and a fantastic interpretation of the challenge picture. We are so fortunate to have you as a guest designer for our June release! Please contact us at customerservice@averyelle.com. Today I can finally show you previews of one of our stamp sets. 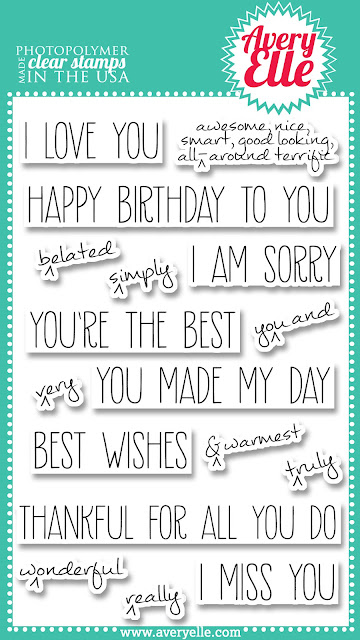 Our 4" x 6" Handwritten Notes clear photopolymer stamp set is perfect for creating custom fun greetings. 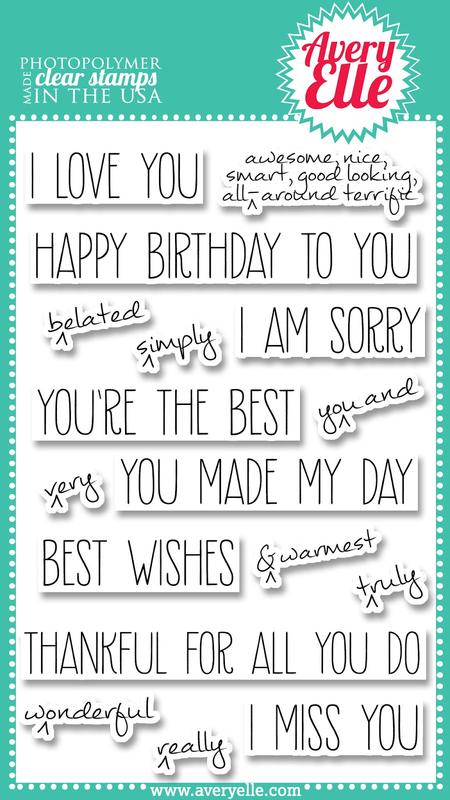 The sentiments included in this set are great for every occasion. The caret stamps allow you to customize and emphasize the greetings as you wish. Possible Sentiments Include: I ^Simply Love You , I ^Truly Love You, I ^Really Love You, I Love ^awesome, nice, smart, good looking, all-around terrific You, Happy Birthday To ^ awesome, nice, smart, good looking, all-around terrific You, Happy Birthday To ^wonderful You, Happy ^belated Birthday To You, I Am ^really Sorry, I Am ^truly Sorry, I am ^very Sorry, You're ^simply The Best, You're ^really The Best, You're ^truly The Best, You ^truly Made My Day, You ^really Made My Day, Best ^ & warmest Wishes, Thankful For ^you and All You Do, Thankful For All ^wonderful You Do, I ^Simply Miss You , I ^Truly Miss You, I ^Really Miss You, I Miss ^awesome, nice, smart, good looking, all-around terrific You . Measurements: Happy Birthday To You sentiment: 3 3/8" x 7 /16" ; ^wonderful sentiment: 1 1/8" x 3/8"
I created a simple card using a sentiment from this set and an arrow from a set that you will be seeing later this week. 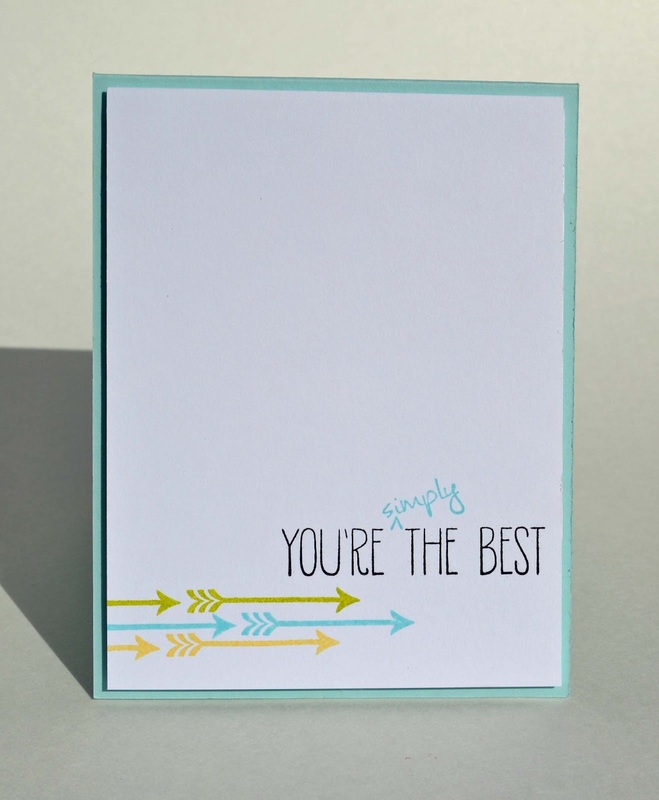 When I designed Handwritten Notes I wanted to make sure that there was a lot of options for customizing the sentiments. I know that I will be reaching for this set over and over. Thanks for stopping by to take a peek. I would love to hear what you think about this new stamp set. Have a great day! Congrats, Jen. Love your style and will be looking forward to your card for the June release. Jamie, love your Handwritten Notes set. You always come out with unique designs. Way to go, Jen! Gorgeous stamp set. Can't wait to see more! I love this stamp set - what a great idea to have the add in sentiments. Congrats Jen! 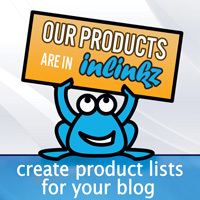 Lookong forward to your creations!! Congrats Jen!! Your card is fab! LOVE that stamp set too...the font & sentiments are great! 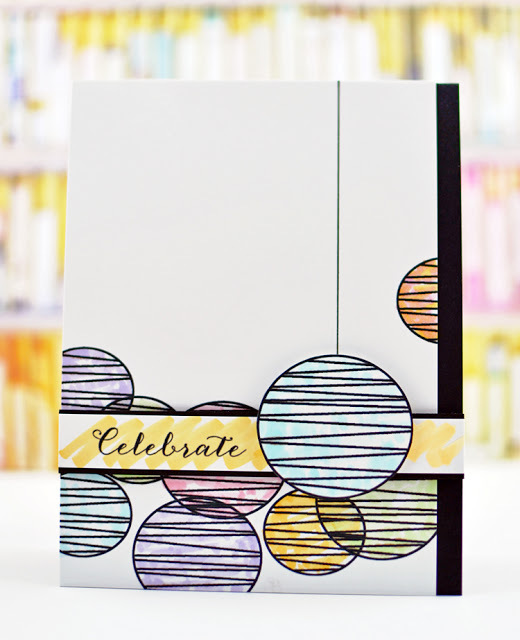 Beautiful stamp set - congrats Jen! love that set! the little carrot word additions are awesome... i would use those ALL the time! VERY clever stamp set - love it! Awesome stamp set!! Loooove the sentiments! What a great set!! I love the font that you used and the sentiments are very 'usable'!!! LOVE IT!! Great stamp set! Congratulations Jen! I just love all these sentiments and I adore the little handwritten additions. Super creative! I know I am going to want that sentiment set! LOVE the font.